Preheat a pan on medium heat and meanwhile, cut up your yellow squash (I like to cut it lengthwise, but whatever you prefer). Add a very small amount of olive oil to your pan. I add the oil and then wipe the pan with a paper towel, spreading it evenly and removing the excess. Adding too much oil will make the squash soggy. 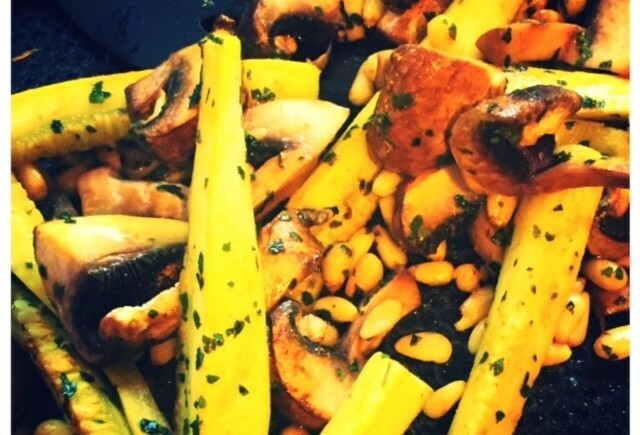 Add the squash and pine nuts and sauté. Once the squash is slightly tender/gently browned, add mushrooms, butter, cilantro and turmeric. The turmeric is strong so don’t add a ton, but cilantro balances it out. Salt and pepper as desired. Sauté just until veggies are cooked (do not overcook). Finally, drizzle and mix with a tiny bit of honey and serve. We like to eat this at breakfast with our eggs, but it would be great any time! The key component on what’s holding you back will not be what you’re doing or not doing inside the gym but what you’re doing outside the gym! At Calibrated CrossFit, we will not try to sell you diets, promote fads, or try to get you to buy products that you don’t need. We believe in real food. We believe in quality meats, organic fruits and veggies, real nuts and berries. We want to provide you with the best nutritional advice that we feel will provide the highest payoff in terms of performance, wellness and overall health. We give advice on what we believe and practice ourselves. We don’t believe in shortcuts. We believe in hard work and dedication. The base of overall wellness is good nutrition. -When acquiring all foods, it is of great most importance that you get them in their freshest least processed state. You want the food you eat to have the least amount of time possible from when it was living or naturally in the ground to the time it goes in your mouth. * When choosing fish & seafood it should be non-farm raised! fed grass, not corn, or soybeans. The same goes for eggs & milk. * Responsible & ethical food consumption should be the #1 highest priority. The quality of natural/fresh/organic/grass-fed products makes all the world of difference in terms of food quality & nutritional value. There is an enormous amount of proven scientific research to back this. Do not cut corners because of cost & convenience because at the same time your cutting the corners of quality, health & most importantly results. – Always keep a “high calorie jar” in your bag. A mixture of nuts and dried fruits. 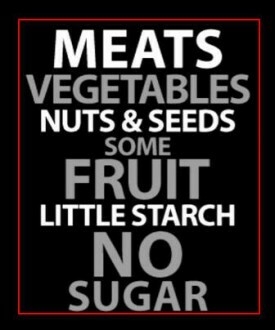 No salt and no added sugar! If you’re feeding time gets delayed reach in and grab to big handfuls and chow down. Your concoction can contain dried fruits (apricots, blueberries, raisins figs, cherries, mango slices), nuts (pistachios, cashews, walnuts, dates, pecans, brazil nuts, hazel nuts, macadamias), and seeds (pumpkin, sesame). This provides loads of good quality high calories, selenium from Brazil nuts, magnesium from the cashews, and antioxidants from the dry fruits. I usually buy a good size bag of everything above and mix all of it in a big pot. Then pour the mixture into a gallon freezer bag. Use this freezer bag as your refuel station. – Stay hydrated!!!! You should drink .6-.7 ounces of water per pound of body weight. If you weigh 200#s you should drink 120-140 ounces of water per day. An easy way to ensure your quota is to fill up a container of your measured amount every day and by the end of the day it should be empty. Good and Bad Protein sources (The info below I gathered from Mark Sisson “Marks Daily Apple” from which I base a lot of my diet. -Peanuts are one of the least nutritious nuts (and they’re not technically a true nut anyway). When adding a handful of nuts to your salad for protein, go with almonds. Almond butter is less toxic and allergenic than peanut butter, although the protein amounts are similar by comparison (between 6 and 8 grams, usually). -Green beans are decent veggies. But these “beans” contain very little protein. Kidney, northern, navy, lima and other starchy beans are also rather limited in their protein amounts and contain a high amount of carbohydrates. No comparison. The European stuff is richer, fattier, more nutritious and lower in sugar. Again, when choosing an animal protein source, choose one that also provides valuable fats to maximize nutrition. Don’t go for the conventional animal products that are high in chemicals, hormones, bad fats, and sugars. Yogurt isn’t a staple of my diet, but if I eat it it’s certainly not a plastic cup of sugar-infused strawberry dessert. I don’t think I need to go into this one. If eggs were meant to be eaten as mechanically-separated, low-fat, chemically-altered whites in a carton, the chickens would have done it by now. But an egg is a chick in the making. It’s rich in antioxidants, good fats, vitamins, and – for the calories – a lot of protein. Things like Egg Beaters are the result of food manufacturers exploiting fears based on grossly inaccurate health information. There’s nothing healthy about such unnatural products. Fish is healthy, right? Don’t even bother patting yourself on the back for eating salmon if it’s from a farm. Farmed salmon is produced in a way that’s the seaside equivalent of a chicken factory. As a result, the fish are often sick and infected. They’re fed cheap feed that does not yield the desirable Omega-3-rich flesh. They’re miserable. Stick with wild only. Most restaurants use farmed salmon, so you have to get a little aggressive about this. No comparison. Did you know chicken has flavor? Yeah, bizarre, I know. Chicken raised properly (not shoved by the cluckload into dirty factories) is rich in EFAs and is one of the most efficient, lean sources of protein available. The average cow is raised on cheap grain that will kill it after about six months (they’re conveniently slaughtered before this happens – but not always). Hardly something I want to put in my body. Grass-fed, organic beef won’t make the vegetarians happy, but this beef is rich in beneficial fatty acids that are missing from the factory-raised cattle. It’s cleaner, healthier, more flavorful, and richer in nutrients. And grass-fed beef is typically raised in humane conditions. If you eat beef, grass-fed is a must. It’s getting quite easy to find these days, but you can order online from many outlets as well.